1990 eagle talon tsi awd 5 speed 114K miles that is very clean!! The only rust on the car is around the sunroof, which is only surface rust!!! Car runs and drives great, just burns oil because the valve seals are bad! Here a list of new parts with under 500 miles!! the only problem with the car is the valve seals need to be changed, there currently is not a radio in the car, and needs a headliner. The only reason I am selling the car is because I am having a kid, and need to sell this and my truck to get a 4 door!! There is a ton of money and work into this car without much else needed to be done. Also about 10 Miles for his house I ran over something metal and blew out the Driver side rear tire. Pictures tomorrow. cool. so no more G6? and you couldnt get that blue one in the background? Looks good, pretty cool. Faster and more aftermarket than the G6 for sure. Good Luck! so is this official? did you get this car? Is that tape on the muffler and HOLY DIRTY ENGINE BAY!!! They painted the block green. And WTF is that on the muffler? If that's not tape then what is it on your fart cannon? Very nice ride, bring it back to life, and you will have a sweet ride! yumm.... i want another dsm so bad now! argh!!! anyways, lets see the project come back to life. the tubular manifold is already t304 stainless steel so you can weld the sucker nice and good and it will take a good beating. look for a cyclone intake manifold. the intake manifold you have looks like the 1.8L intake manifold which is junk. but i can't tell since their is so much stuff over it. anyways, the muffler doesn't have tape. that is rattle can red paint that just chipped off. its a tuner and the fart can is very common on tuner vehicles whether people like it or not. all to their own. i can't wait to see this car come back to life. looks like the upper intercooler pipe was replaced due to the stupid bulging stock pipe. i hate that thing. this is what your motor could look like. my buddy and i got together on his car and started to do some work. 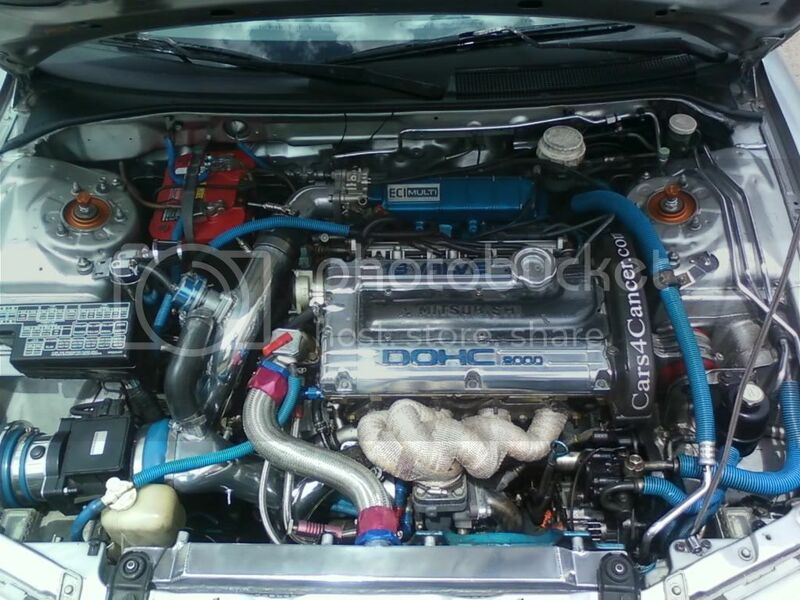 his car is a little riced out to be honest but this is the work of someone passionate for dsm's. thats a small 16g turbo. doesn't look like a specific brand or original so i am thinking its an ebay turbo. the wastegate actuator flange does need to be opened by force by an air compressor so go ahead and do that. hey.. if you have any questions, you should come by my buddies site www.controlledchaoscarclub.com. you can talk dsm talk with both my buddy nate and I and we can definitly help you out with questions about your ride. let me know if you have any other questions bud. good luck on the project.